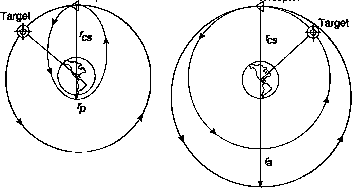 previous example, the total velocity change required to go from low-Earth orbit to geosynchronous is 4.71 km/s using a spiral transfer. We obtain this by subtracting the results of step 3 from the results of step 2 in the above example. where V. is the velocity before and after the burn, and 0 is angle change required. Fig. 6-9. 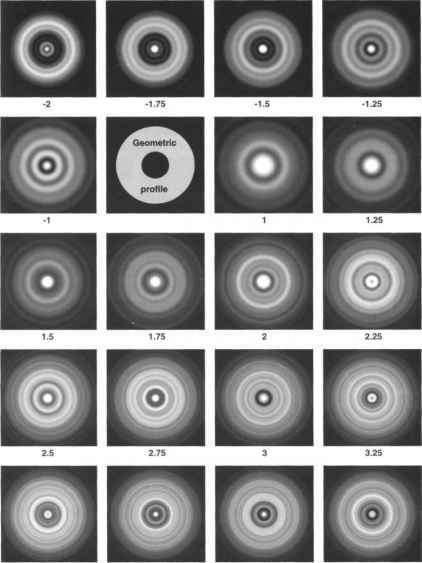 Vector Representation of Simple and Combined Changes in Orbital Plane. For the simple plane change, the magnitude of initial and final velocities are equal. where Vi is the initial velocity, Vj\s the final velocity, and 0 is the angle change required. 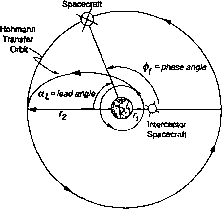 Completing a Hohmann transfer followed by a simple plane change would require a velocity change of 5.44 km/s, so the Hohmann transfer with a combined plane change at apogee of the transfer orbit represents a savings of 1.15 km/s. As we see from Gq. (6-39), a small plane change (0 £ 0) can be combined with an energy change for almost no cost in AV or propellant. Consequently, in practice, we do geosynchronous transfer with a small plane change at perigee and most of the plane change at apogee. Another option is to complete the maneuver using three bums. The first bum is a coplanar maneuver placing the satellite into a transfer orbit with an apogee much higher than the final orbit. When the satellite reaches apogee of the transfer orbit, it does a combined plane change maneuver. This places the satellite in a second transfer orbit which is coplanar with the final orbit and has a perigee altitude equal to the altitude of the final orbit. Finally, when the satellite reaches perigee of the second transfer orbit, another coplanar maneuver places the satellite into the final oibit. This three-burn maneuver may save fuel, but the fuel savings comes at the expense of the total time required to complete the maneuver. where ^is the phase angle (angular separation of target and interceptor) needed for rendezvous, is the initial phase angle, k is the number of rendezvous opportunities, (for the first opportunity, k = 0), co,„, is the angular velocity of the interceptor, and <olgt is the angular velocity of the target We calculate the lead angle, aL, by multiplying oa,gl by the time of flight for the Hohmann transfer and is 180 deg minus aL. Fig. 6-10. Geometry Depleting Rendezvous Between Two Circular, Coplanar Orbits. The phase angle is the angular separation between the target and interceptor at the start of the rendezvous and the lead angle Is the distance the target travels from the start until rendezvous occurs. The denominator in Eq. (6-40) represents the relative motion between the interceptor and target As the size of the interceptor orbit approaches the size of the taiget orbit, the relative motion approaches zero, and the wait time approaches infinity. If the two orbits are exactly the same, then the interceptor must enter a new phasing orbit to rendezvous with the taiget (Fig. 6-11). For this situation, the rendezvous occurs at the point where the interceptor enters the phasing oibit. The period of the phasing oibit equals the time it takes the taiget to get to the rendezvous point. Once we know the period, we can calculate the semimajor axis. The two orbits are tangential at their point of intersection, so the velocity change is the difference in magnitudes of the two velocities at the point of intersection of the two orbits. Because we know the size of the oibits, and therefore, the energies, we can use the energy Eq. (6-4) to solve for the current and needed velocities. The techniques described above move the target vehicle close to the interceptor. Once the two vehicles are close to each other they begin proximity operations by solving a set of relative motion equations to achieve the final rendezvous. Vallado  contains an excellent discussion of the solution to the nearby relative motion problem, as addressed by the Clohessy-Wiltshire or Hill's equations of relative motion. Similar to the rendezvous problem is the launch-window problem, or determining the appropriate time to launch from the surface of the Earth into the desired orbital plane. Because the orbital plane is fixed in inertial space, the launch window is the time when the launch site on the surface of the Earth rotates through the orbital plane. As Fig. 6-12 shows, the launch time depends on the launch site's latitude and longitude and the satellite orbit's inclination and right ascension of the ascending node. • No launch windows exist if L > i for direct orbit or L > 180 deg - / for retrograde orbits. • One launch window exists if L = i or L = 180 deg - i. • Two launch windows exist if L < i or L < 180 deg - i. Fig. 6-12. Launch Window Geometry for Launches near the Ascending Node (1) and Descending Node (2). The angles shown are the orbital inclination (I), launch site latitude (/. ), and launch azimuth (ft). where VL is the inertial velocity of the launch site given by Eq. (6-46) below, Vgg = 464.5 mis is the velocity of Earth's rotation at the equator, and V0 ~ 7.8 km/s is the velocity of the satellite immediately after launch, ft is the inertial launch azimuth and y is a small correction to account for the velocity contribution caused by Earth's rotation. For launches to low-Earth orbit, y ranges from 0 for a due east launch to 3.0 deg for launch into a polar orbit The approximation for y in Eq. (6-42c) is accurate to within 0.1 deg for low-Earth orbits. For launches near the ascending node, P is in the first or fourth quadrant and the plus sign applies in Eq. (6-42a). For launches near the descending node, /? is in the second or third quadrant and the minus sign applies in Eq. (642a). Equations (6-45c) do not include losses in the velocity of the launch vehicle because of atmospheric drag and gravity—approximately 1,500 m/s for a typical launch vehicle. Also, in Eq. (6-45c) we assume that the azimuth at launch and the azimuth at burnout are the same. Changes in the latitude and longitude of the launch vehicle during powered flight will introduce small errors into the calculation of the burnout conditions. We can calculate the velocity required at burnout from the energy equation if we know the semimajor axis and radius of burnout of the orbit [Eq. (6-4)].